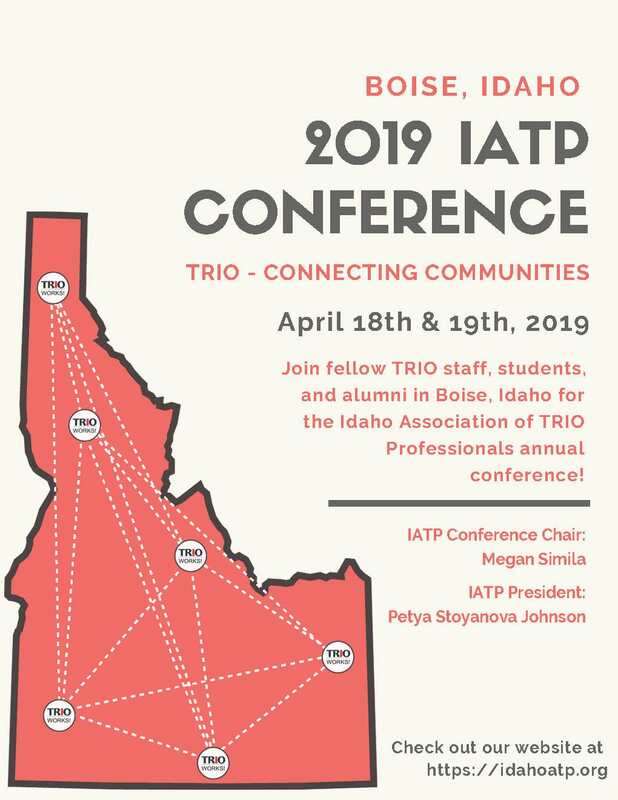 The Idaho Association of TRIO Professionals is hosting its annual conference at Boise State University on April 17th and 19th. Collectively, the TRIO programs in Idaho serve 8600 first generation, low-income students each year; supporting them on their way to achieve success in their academic journey. The theme of our annual conference this year is Connecting Communities. We are asking organizations and community partners to consider sponsoring a table for our conference reception on April 18th. We are a non-profit organization and all proceeds from sponsorship will go towards professional development, community outreach, as well as student scholarships. Our main goal for the reception is to connect community members who are passionate about providing equal opportunities for all students in our state. We are including the annual IATP Factbook that highlights our programs and a few of our alumni. All sponsors will be included in all conference materials and highlighted in our program. $1000 TRIO Sponsor – 4 conference reception invitations for members of your organization, recognition in all printed materials, as well as a half page printed sponsor ad in our conference program. Marketing booth space available upon request. $2000 TRIO Achiever Sponsor – 4 conference reception invitations for members of your organization, recognition in all printed materials, as well as a full page printed sponsor ad in our conference program. Marketing booth space available and the option to include printed materials in each conference attendee’s packet.